Tarot Exercise – colour your own! Once upon a time, somewhere on the www, I found uncoloured line-drawn copies of the RWS cards. I have found it very useful to colour my own as a tarot exercise, and am always pleasantly surprised by what is revealed to me in the process. Perhaps it’s because I look at the cards differently during the process of colouring them, seeing details I had not noticed before. An example of this is the Three of Swords card. When I spent time colouring this card in I unexpectedly noticed that the swords were sharp upon entering the heart but blunt upon exiting it! Something changed the blades in the process of piercing the heart! 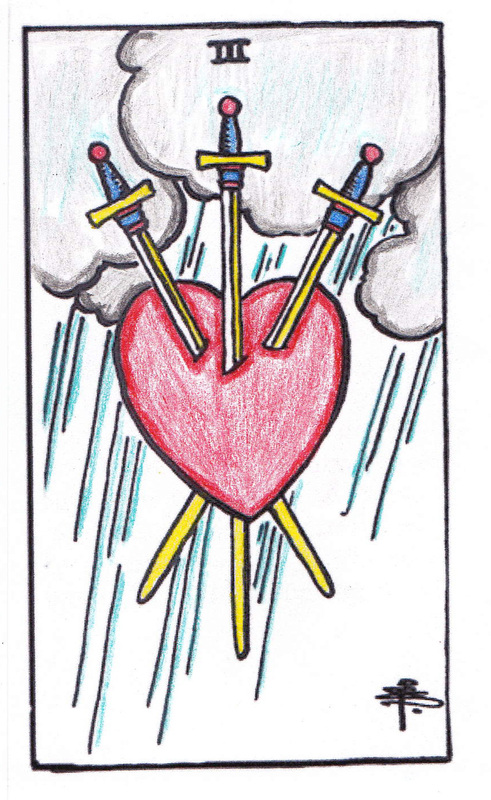 This was something I had really not noticed before colouring in my own Three of Swords card. I also noticed for the first time that it was raining (in the card)! In these unexpected discoveries lie exciting new layers of possible interpretations to further enhance our reading abilities. I kept the line-drawings and am making them available here for download. Perhaps you’d like to give this exercise a try too? If you do, let me know what new revelations you uncover! Apologies for the ‘order’ (disorder) that these are in, but it seems all 78 cards are here. I have listed the cards that appear on each page below, with links to download the pdf documents. got to save this awesome link! Fun way to learn the tarot! Thank you for this. Our group has just completed this exercise, working with colour and colouring in cards. It was interesting to see who stayed with the prescribed colours and who added their own spin to the cards. You are so welcome! Did your group use the iTongo deck or the RWS deck? RWS. I of course did a blend of the two. The card I chose was The Star – I cut out the water pourer and added backgrounds from my Ace of Water, The Star and The Universe. Actually worked out pretty well. Thanks for these images, Rootweaver! I’ve the box set of Color Your Tarot and this is a good reminder to pull it out and go to work! I’d highly recommend this set as it contains a full-color deck, but also a complete BW line drawing deck to color in –AND it comes with colored pencils. That sounds fabulous Jason! I’ll add it to my growing wishlist 🙂 Thanks for taking the time to comment. Many years ago I bought an uncolored set of the RW major arcana. It came with a book telling what colors should be used for each thing and why. While actually coloring the cards, I found that I agreed with some of their ideas and disagreed with others as they didn’t fit the meanings the cards had for me. Once I started questioning the colors, I went on to question the validity of the cards themselves for me. They really didn’t fit my view of the world. I don’t know if my view was right or wrong, but it was the one I was living with then. I started re-drawing my own set of cards, and went on from that to hold a class for tarot readers in which everyone — artist or not — rethought each card with the help of study and inner journey meditations. That is quite profound Jessica! I can completely understand your reasoning. Thanks so much for taking the time to comment and to share your wisdom.